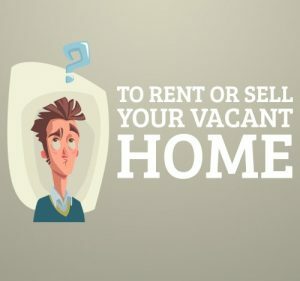 Before you can look at the pros and cons of selling your home instead of renting it, it’s important to look at the main reason why you should sell your vacant home. If your vacant home is in a neighborhood where the value is sinking, it’s best to sell this house and move on as fast as possible. By doing so as quickly as you can, you will get more money than you normally would unless you plan on waiting to see if the value will go back up, which is an extremely bad idea. Once the plummet in value has begun, it’s hard to know when it will stop, or if it will stop at all. Speaking to a real estate agent who has experience and knowledge about dropping neighborhood value will help you in figuring out what to do. If the agent believes that the value is not going to go up anytime soon, or at all, it’s best to sell your vacant home as soon as you can. By using a real estate agent to sell your vacant home, the process will go a lot more smoothly when compared to doing it by yourself, especially if you need to sell it within a short period of time. Although, if you are still unsure whether or not you want to sell or rent your vacant home, or you’re willing to take the chance in a neighborhood that is losing some of its value, then the pros and cons below will help you to decide on your final decision. The biggest pro when it comes to renting out your vacant home is that you’ll have a second source of income. For example, finishing the basement and adding a kitchen and a bathroom, if there is not a bathroom in there already. This will turn it into a basement apartment, and increase the home’s value for resale. By renting out your vacant home, you will successfully avoid squatters, vandals, and thieves. For example, if you own a vacant home and you are barely there, squatters and vandals are going to take notice. Don’t be surprised if one day you show up to the house, especially if you are not there for weeks or months at a time, and find a squatter. Therefore, it’s best to rent it out, so there is someone living there if you are not planning on selling it. Bad tenants are considered tenants who cause damage to your property, are always late on rent payments, or don’t pay rent period. This will cause you additional expenses for any repairs that need to be done, and will eliminate all of the benefits of renting out your property to begin with. You could always have background checks conducted on each potential tenant, but sometimes this will not show you all you need to know until it’s already too late. Another con would be tenants making the home difficult to sell. For example, say you have let your tenant know that you are planning to sell, and that they have to relocate within two months’ time. If they do not have options, they will try to make it as difficult as possible to sell the home. Whereas if your home were empty, you could easily clean up, get the property ready for the potential buyers, and make any necessary repairs without having to work around your tenant’s schedule. One of the biggest benefits of selling instead of renting is, you guessed it, the money. Even though you would be getting income each month from your tenants, whether it’s for rent solely or both rent and utilities, you will also have to spend on repairs, new appliances if anything breaks and anything else that goes wrong. This can get incredibly costly, and there’s no real way to plan your budget when you do not know what could happen. It could also start an issue if you, for whatever reason, have to add utilities to their rent, and they make a scene about it. By selling your vacant home, you won’t have to deal with tenants or utilities, period! You will no longer have to worry about squatters, or tenants completely wrecking the place and making the value of the home plummet to the point where you’re spending thousands of dollars trying to fix it and make it a home again. Plus, you will save hundreds of dollars per year when it comes to maintenance that you will no longer have to do anymore, which will also help to give you a peace of mind. Based on the pros and cons listed for you, the decision to either rent your house out to tenants or sell it should be an easy one. By selling, you won’t have to worry about risky tenants, keeping up with constant maintenance, squatters invading, vandals destroying the place, and you will not have to pay utilities or a second mortgage anymore, if applicable. However, if you do decide to rent out your vacant home to tenants, just be sure that you know what you’re doing, you are careful with who you choose to rent the home out to, and always stay on top of maintenance and repairs. You will probably have to spend more money than you will receive for rent and utilities, if you choose to not to charge for them, but it may work out for you in the end. Once you make a final decision, it’s best to get on it immediately. Whether that decision is renting your home, or contacting a real estate agent to help sell the house as quickly as possible.